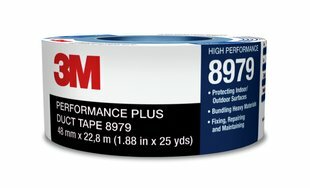 3M™ Performance Plus Duct Tape 8979 has a unique construction that allows for both temporary and permanent indoors or outdoors applications. It is removable with little or no adhesive residue from most opaque surfaces for up to 6 months after initial application. Resists UV, sunlight, and weather to last for up to one year before deterioration. The adhesive will reliably stick long-term on most surfaces. Protects against light abrasion including overspray from bead blasting or sand blasting. Excellent for hanging polyethylene drapes for containment activities. Protects against grime, UV, and weather, then provides a clean and easy removal.